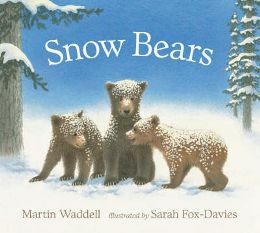 ‘Snow Bears’ is a lovely picture book written by Martin Waddell and illustrated by Sarah Fox-Davies. It tells the story of a snowy day when a mummy Bear and her three baby bears go outside to play. The baby bears are soon so covered with snow that their Mummy declares that she has lost her babies and the bears go along with the joke, pretending that they are Snow Bears instead. The bears then proceed to have a fantastic day playing lots of games in the snow, although Mummy Bear always says that it is such a shame that her babies are not there because they would love doing all the things they are doing! “I don’t know where we are,” said the biggest snow bear. “I haven’t seen us,” said the middle-sized snow bear. “We aren’t here, Mummy Bear,” said the smallest snow bear. My daughters love joining in with these responses, and they find it really funny that the snow bears are teasing their mummy and that she is going along with the joke! At the end of the story, the bears are all feeling the cold so they go inside to warm up and Mummy Bear goes off to make some toast. Of course, as the bears warm up, the snow melts, so when Mummy Bear comes back the snow bears have disappeared and her babies are back in their place! The bears confess that they have been playing a joke on their mummy. But who will eat the toast, she asks. Well, you can probably guess! This is an excellent story book for young children. It tells of such a loving relationship between mother and babies but also says that it’s OK to play jokes! I think the story line is very sweet, and there are beautiful illustrations to accompany it. It is also a lot of fun to read, particularly if your child gets the joke! The language used is very suitable for young children and the conversations between Mummy and babies is very true to life. Because a lot of the conversations are repeated, my daughters know the words very well and are able to join in with most of them. ‘Snow Bears’ is a beautiful book that your child will probably want to read over and over again – I know mine do! No Comments on "Snow Bears"